Anyone who thinks gold isn’t driven by momentum right now should take a hard look at this chart. While the chart isn’t complete proof, it is at least a strong indication that a substantial part of gold’s price rise since 2002 has been due to the birth of exchange traded funds and the new gold demand they created by letting anybody trade gold as easily as a stock. 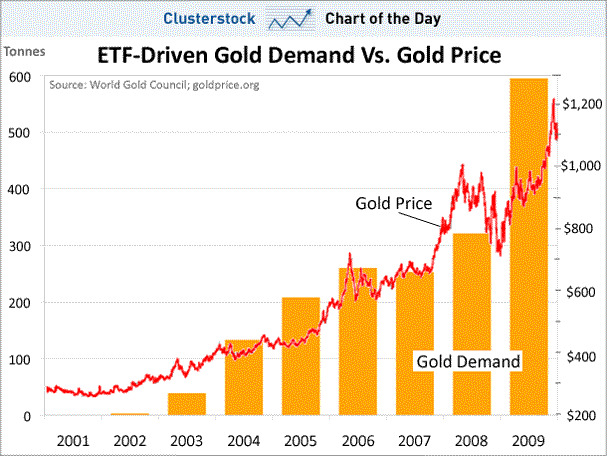 It makes a strong case for the argument that gold’s price has largely been driven by ETF fund flows. Note traditional forms of demand, such as jewelry, fell both in 2008 and 2009 according to the World Gold Council (not shown). This is why today’s gold market is nothing like that of the past. ETFs have allowed speculative buyers to rapidly move in and out of the asset, which has changed the nature of the investor base driving the metal’s marginal price. Trust us, the hate mail we receive just for debating gold makes this pretty clear. See, the gold buyers of the past didn’t have the hair-trigger trading capability of the present ETF group, and there was a time when gold was considered simply a store of value rather than a vehicle for making huge upside. Which is why some research firms have voiced concern about gold’s suspected dependency on fund flows for price support. 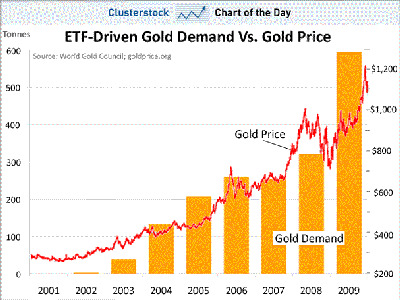 Note how 2009 ETF-driven gold demand soared. It might be hard for 2010 to repeat this performance, especially if recent investors who are in it for quick returns start to think gold might be boring.